I was so revolted the first time the Ottawa Citizen leftards published this twerp’s vapidly inane maudlin lies and taquiyya drek, that I deliberately blocked it from my consciousness, and somehow managed to successfully ignore it – but not after today, when they gave him another platform upon which to spew his context-free metaphors and otherwise abstracted idodlatrous public deceptions. How did Damian Clairmont become Mustafa al-Gharib? Clairmont came from an Acadian family living in Calgary. News sources showed that he went from an up-and-coming athlete to a troubled teenager. Following his conversion to Islam, it was said that he was beginning to show signs of progress. Then the story shifts. He tells his family that he is going to study Arabic in Egypt while actually joining the ranks of Jabhat al-Nusra. On Jan. 14, 2014, Clairmont became the second Canadian fighter to be killed in Syria. I’m a convert to Islam, so this news piqued my curiosity. I, like Clairmont, converted in my early 20s. I had my struggles before coming to the religion and sought solace in my new path. This seemed to be the case for Clairmont. His Islam came from a desire to transform his habits and his way of life. The transformation, though, is paired with a particular vulnerability characterized by an openness of heart and a desire to learn. In my own experience, I found teachers quickly, who not only taught me the basics of the religion, but acted as mentors and spiritual guides. These were and still are the people I rely upon in shaping my Islam. Did Clairmont have someone who transformed him into Mustafa al-Gharib? This is an important question. Conversion is all about transformation. Conversion is a process of becoming and it is this process that must be understood by both the Muslim community and the Canadian community at large. An important traditional concept that must be revived is tarbiyah, which, as my teachers have taught, is defined as formal education and spiritual training. Of course, tarbiyah is relative to the student’s ability. In this sense, tarbiyah could be a training of practical skills such as woodworking, sewing or farming, to the intellectual sphere of sacred knowledge. Developing tarbiyah is perhaps a key solution to the few who fall through the cracks because it is the transitional guide from the mere submission (Islam) to the sphere of excellence (ihsan). Creating spaces that facilitate that teacher-student relationship, so essential in the concept of tarbiyah, can provide a necessary framework in becoming Muslim. If Muslims are to speak up on Clairmont’s death, which I am sure they have, the first declaration will be a justified criticism of radicalization. Mosques, imams and community leaders work tirelessly in condemning extremism. “Islam is a religion of peace” has become the axiom of Muslims in the West. The issue is not the effort in preaching peace, integration and solidarity among Canadians at large but it is in the absence giving space to converts to become Muslim and make their Islam authentic. Many dimensions can characterize this space of becoming: from intellectual and scholarly studies to community-oriented activism. By creating these spaces, converts can fully actualize their new identity as Muslims. In other words, there is a need to institutionalize tarbiyah. Unfortunately, from my own personal experience, I have found tarbiyah to be absent from our institutions. There are programs to help converts cope with new issues, from learning basic tenets of faith, prayer, and even Arabic. I needed to seek out personal relationships from people who have deeply studied the religion. However, very rarely do we find institutional spaces that assist converts to become potential community leaders, scholars or imams. Most imams in the Muslim community come from scholarly institutions overseas that are culturally alienated and are themselves seeking to convey their knowledge in the language of their new environments. Clairmont had mentioned to his mother that he wanted to study in Egypt to become an imam. Perhaps, Egypt was one of the places he thought he could find an authentic Islamic institution that would be broadly recognized. Nevertheless, it is clear that, as a convert, Clairmont wanted to justify his Islam. Clairmont did not become an imam; rather he sought to fight as a mujahed. In his eyes, his fighting made his Islam authentic; The tarbiyah he found was in the way of fighting. In Canada, there may have been emotional or psychological support, but he couldn’t find a space to actualize himself. Becoming Muslim is a process of making one’s Islam authentic, which involves bridging a cultural identity with a religious outlook. If a lesson can be drawn by the tragedy of Damian Clairmont, it is the importance of creating a culture that is at once authentically Muslim and Canadian. To do so, I believe, there is a growing need for community leaders to be both knowledgeable in the Islamic sciences while remaining steadfast to a Canadian culture. In this sense, converts would no longer feel like strangers. In the future of Islam in the West, I envision the need to have institutions that are training Imams in seminaries in Canada and in the United States. Once these would be established, the possibilities of becoming Muslim will be exponential. No longer would converts look afar to authenticate their Islam, as they would have examples of leaders, scholars and activists who understand the cultural context. Clairmont became Al-Gharib. He called himself Mustafa The Stranger, translated as Al-Gharib. He was estranged from both his Canadian community and his Muslim community. He may not have been alienated from his religion, but he was alienated from his culture and his roots. When I meet a new convert, I always make sure to ask them where their ancestors are from. This questions often throws people back as if being Canadian contradicts being Muslim. I seek to change that. Becoming Muslim, for a Canadian convert, means understanding how Islam will shape one’s Canadian identity. Only institutionalized tarbiyah, through traditional scholarship that trains culturally relevant leaders and through artisanship and craftsmanship, that revives excellency in work can a convert embody excellence in their Islam. 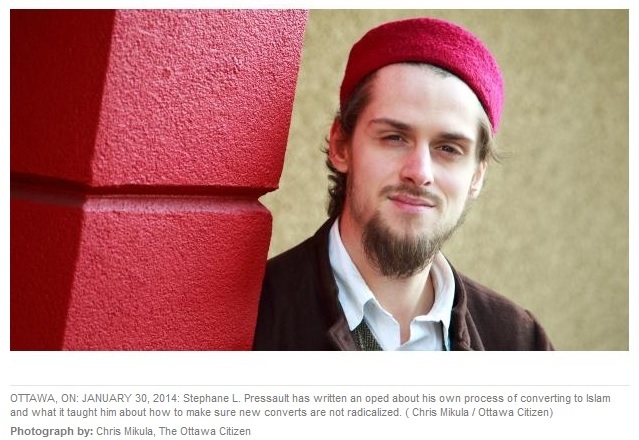 Stephane L. Pressault converted to Islam in 2009 while pursuing his studies in philosophy at the University of Ottawa. Currently, he is a master’s candidate in public ethics at Saint Paul University. His area of research and interest includes Islam in the West, Islamic law, ethics, multiculturalism, secularism and ethics of hospitality. By Stephane L. Pressault, Ottawa Citizen Wednesday, March 19, 2014 P.# A13. After speaking with the mother of a Canadian Muslim convert who was killed in the Syrian civil war, I was confronted with the reality of my prejudice and the failings of both the Muslim community and Canadian society at large. Damian Clairmont died fighting within the ranks of Jabhat al-Nusra on Jan. 14. After I wrote an article trying to make sense of what happened to Damian, I was contacted by his mother. We spoke for about an hour and she shared her son’s story with me. She showed me how a mother will always love her son. Heart-wrenching as it was, Christianne Boudreau explained two points to me that she has been tirelessly struggling to share to explain why her son was not simply evil. Her first point was that she believes the media, the Canadian government and the Muslim community have demonized Damian. It quickly became clear to her that the discourse of radicalization stereotypes those vulnerable to its effects as psychologically unstable, immoral, socially alienated, etc. Within the Canadian Muslim community, there is a great fear, for obvious reasons, of accepting young men like Damian within the community. Yet, the Muslim community has a moral obligation to recognize and understand this issue. Simply talking about radicalization, extremism and terrorism is not an effective way to take a stand against it. Institutionally, Canadian Muslims are making a great effort to tackle these issues. This becomes ineffective, however, when the process of radicalization is happening in isolated spaces on the fringes of the community. My discussion with Boudreau concluded with her second point. Conversion is a process that can entail profound sincerity. A convert experiences a new community and is often alienated from new terms and concepts that are habituated within that community. Boudreau explained to me that her son’s sincerity had been exploited for particular political motives. This is the essential point that needs to be discussed. Instead of labelling these young men as radicals or insane, the Muslim community must see them as victims of fringe extremist political ideologies. The Muslim community must allow for a public discussion on the meanings of war and peace in Islam. These discussions, even with their surrounding controversies, must help define, conceptualize and understand these situations. This idea is no novelty. Currently in Abu Dhabi, Muslim scholars across the world are attempting to define jihad in the current context of the Middle East. The conference is entitled Promoting Peace in Muslim Societies. By more carefully addressing the concept of jihad in our contemporary geo-political context, the goal of these Muslim scholars is to demonstrate the illegitimacy of particular approaches to warfare in Islam. Their claim is that religious reformists, such as Jabhat al-Nusra, who have used Islam for various political ends, have betrayed Muslim tradition. Prominent American Muslim scholar, and co-founder of the Zaytuna College in California, Shaykh Hamza Yusuf has also been a participant representing a North-American perspective. The Muslim community must recognize the effort of Muslim scholars and leaders to reclaim Islam from extremists. Meanwhile, it is hoped that the media can increase its coverage of efforts made to bring the work of mainstream Muslim scholars to the forefront of a very important and necessary public dialogue. The conference has four major goals: illustrating the necessity for humanistic values and coexistence, correcting misconceptions from a scholarly point of view, discussing the instrumentalization of numerous fatwas, and promoting ways that Islam can contribute to world peace. These goals represent mainstream Islam. If these ideas can be properly and widely understood by the general public in Canada, the chances that converts such as Damian Clairmont would fall into a fringe extremist organization will significantly decrease. However, if these young men continue to be demonized by the society that raised them, the fire of anger, mistrust and misunderstanding will always be fed, leaving them ever vulnerable to manipulation and exploitation. Scholarly efforts to communicate the mainstream teachings of Islam must be more widely known and supported so that Canadians like Damian Clairmont and his mother, Christianne Boudreau, can be better protected from the harm and pain they have suffered. It is a long and arduous process to communicate and transmit these traditional teachings, however, it is possible. And the scholars in Abu Dhabi have initiated that possibility. Should the United States Give Up Control of the Internet? Obama thinks so! Should the United States Give Up Control of the Internet? Late Friday, away from the news media, the Obama Administration announced its plan to internationalize control of the Internet. The United States built the Internet and has made sure it is open to everyone. This is one public/private partnership that works. We believe, “If it’s not broken, don’t fix it.” Join our effort to keep the Internet under American control. If Obama gets his way, the Internet will likely be controlled by an international organization like the United Nations. Can you imagine the dysfunctional United Nations trying to fairly and effectively keep the Internet in working order and unbiased? DO YOU REALLY THINK THEY’D LET PEONS CRITICIZE THE ISLAMIC CRIME-GANG? We can’t. And we are dedicating our resources to stopping this travesty. With your help, we can stop this travesty. Please consider helping us today with a donation. Together, we can keep America in control of a valuable American asset. Help us today. Become a Partner. You are currently browsing the Vladdi's Blog blog archives for March, 2014.